Sustained periods of unseasonably warm air temperatures and exposed dust at the snowpack surface during late March and early April 2012 have, together, initiated accelerating rates of snowmelt and SWE loss at some, but not all, CODOS Snotel sites. Some CODOS Snotel sites report significant declines in SWE approaching the lowest values in the period of record (for a given date) or even falling outside of the historic range. Those sites may have experienced Peak SWE for WY 2012 in early or mid-March. Recent CODOS snowpits near those CODOS sites mirror those losses of SWE. In contrast, other CODOS Snotel sites and CODOS snowpits show only small losses of SWE. 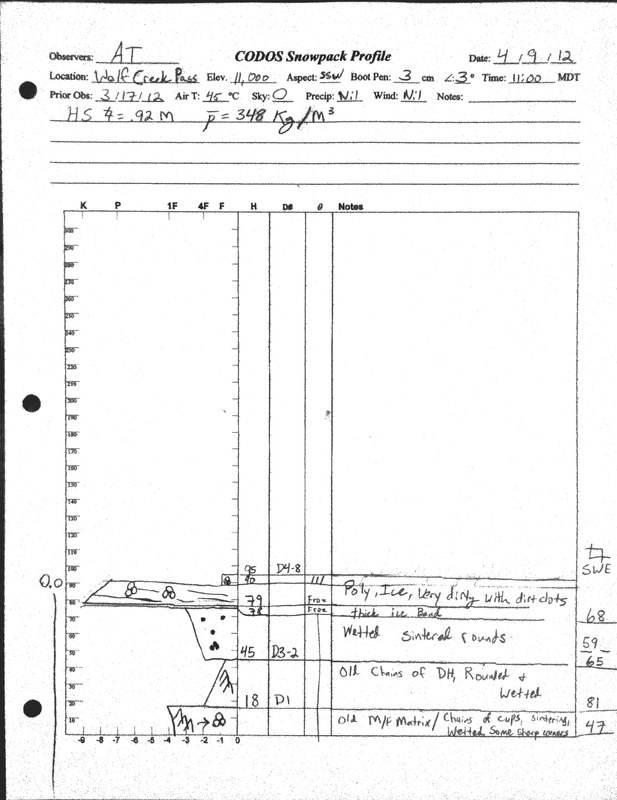 At those sites, energy inputs from warm air and direct absorption of solar energy by dust at the snowpack surface was consumed in warming the snowpack towards an isothermal state at 0° C, as a precursor to the loss of SWE and onset of snowmelt runoff. As of our site visit on April 9, and since our prior site visit on March 17, the snowpack has become fully isothermal and significant snowmelt has occurred at out Wolf Creek Pass CODOS site, while the nearby Wolf Creek Summit Snotel was reporting only minor losses of SWE. Heavy dust was observed at the remaining snowpack surface producing reductions in snow albedo exceeding those observed at the Senator Beck Basin Study Area the day before. [This forecast discussion is current as of Thursday, April 12] Strong SW’ly winds and showers developed on Wednesday afternoon ahead of a cooler airmass bringing unsettled and cooler weather for the remainder of this week, with chances for snow showers each day and temperatures below seasonal norms. Chances increase for more significant snow amounts over the weekend and may result in state-wide restoration of higher snow albedo. Showers may continue into the early work week but high pressure is expected to return to the State by mid-week with dry and warmer weather. 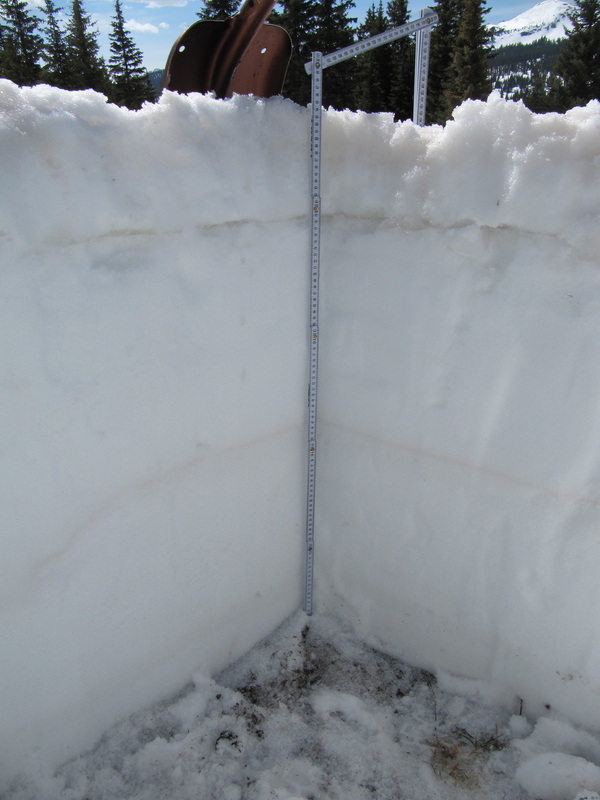 As of April 9th, the CODOS Wolf Creek Pass snowpit site retained 37” (95 cm) of snowcover containing 12.6” of SWE, down from 63” in depth and 21.9” in SWE since March 17th; the snowpack was fully isothermal at 0° C throughout. Very little snowcover remains along the highway corridor leading to Wolf Creek Pass from Pagosa Springs. 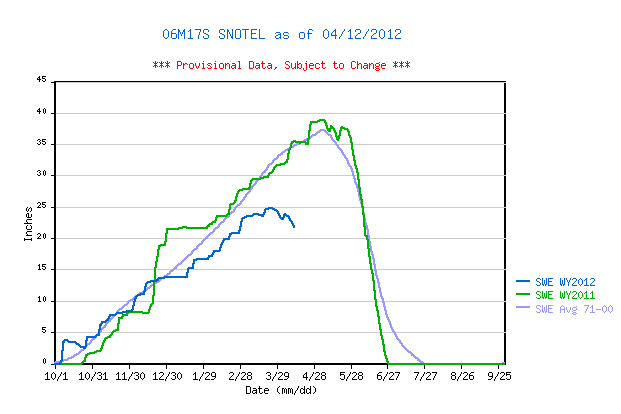 Meanwhile, as of April 9th, the Wolf Creek Summit Snotel reported nearly 22.9” of SWE and 56” of snow depth. Dust event D8 was clearly evident at ths snowpack surface, merged with layers D7-4. A significant dust layer in the middle of the snowpack corresponding to event D3 is more evident here than at the Senator Beck CODOS site or at any other CODOS site. [This discussion is current as of Thursday, April 12] On March 17 we measured 63” of snow containing 21.9” of SWE at our Wolf Creek Pass snowpit site; mean snowpack temperature was nearly isothermal on that date at -0.7° C. As of April 9th, the CODOS Wolf Creek Pass snowpit site retained 37” (95 cm) of snowcover containing 12.6” of SWE, a loss of 9.3” of SWE in 23 days, or 0.44” per day. Nearby, the Wolf Creek Summit Snotel (11,000’) has characteristically recorded a slower snowmelt rate, losing only 3” SWE since peaking on March 23rd at 24.8” after the same storm that delivered dust event D5, and peaking some six weeks earlier than the average date for that site of May 5th. Daily average SWE loss at the Wolf Creek Summit Snotel over those 20 days (to April 12), at 0.15” per day, falls short of rates observed in prior water years, as seen in the table below. Located on the Rio Grande main stem, and bracketed between Slumgullion and Wolf Creek passes, the Beartown Snotel station, at 11,600’, has lost almost 10” of SWE since peaking on March 21st at 17.1”, over a month earlier than normal. At an average daily rate of 0.45” SWE loss, this rate of snowmelt is approaching rates observed in prior years (see table). 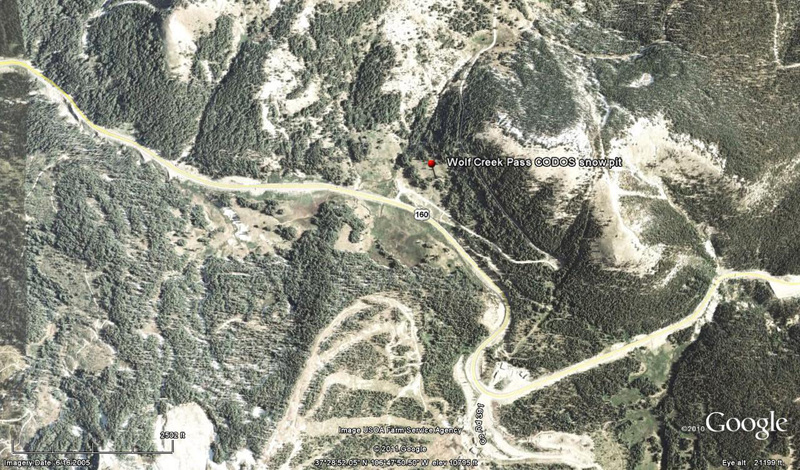 [This discussion is current as of Thursday, April 12, 2012] The Wolf Creek Pass CODOS site offers insight into snowmelt runoff behavior on both sides of the Pass. Streamflow at the Rio Grande at Del Norte gauge have been sustained at levels well above daily median discharge rates since mid-March, surging during the prolonged period of dry, very warm, and sunny weather of late March, with multiple dust layers merged at the snowpack surface. Since our site visit on April 9, a significant surge has driven discharge up to 2,000 cfs at that gauge, almost 4x the median flow for that date, at the same time that dust event D8 has fully emerged in the western San Juan Mountains (Senator Beck Basin is only 18 miles NW of the Beartown Snotel) and with very high temperatures earlier this week. To the west, streamflow data from the USGS San Juan River at Pagosa Springs gauge show a somewhat less amplified but similar pattern, well above median flows.